In Kansas, the benefits of shade are obvious. If you step outside on a summer afternoon, you will quickly move under the canopy of a large shade tree. The sun can be intense. We love the shade that trees provide, as well as the value they add to our homes. However, it can be a real challenge to grow anything under the umbrella of trees, including grass. 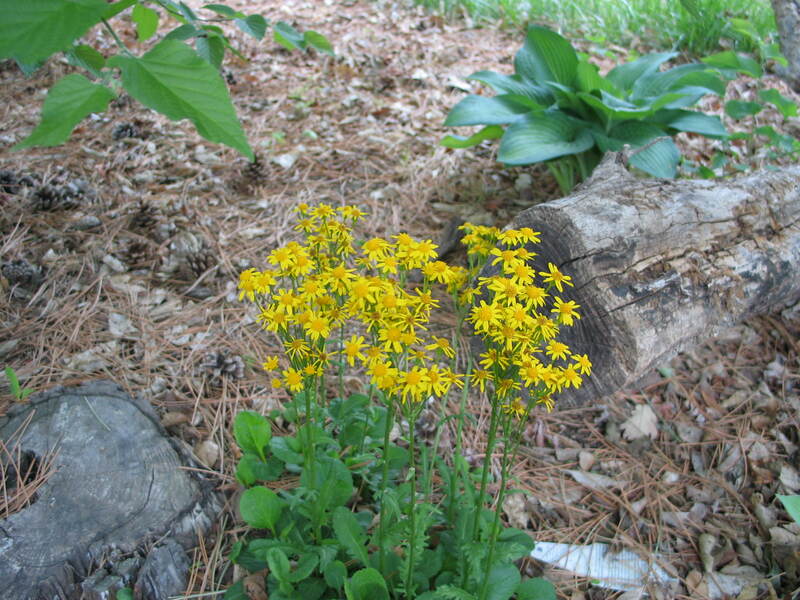 How do you develop a resilient native shade garden? Here are some steps that might improve this problematic area in your yard and maybe begin to change your approach to gardening in the shade. Since we love the trees in our landscapes, we need to embrace the microclimate they provide. Shady landscapes are easy to care for since they require minimal weeding and watering. Generally, there are fewer insect problems. The canopy of the trees protects plants from leaf scorch. Each autumn, a new set of leaves fall, providing winter protection for plants and a fresh dose of organic matter for the soil as the leaves decompose. Discover the type of soil you have and the amount of sunlight your area receives each day. Each of these factors will determine which plants to choose. Two hours or less of sun each day is full shade. A soil that is friable is usually high in organic matter. This type of soil is ideal for most plants that grow in the shade. A sandy soil that is hard and dries quickly is typically found under oak and maple trees with dense shade. One of the best ways to landscape for shade is to mimic nature. Look at examples from woodland settings, then integrate the elements and plants you like the most. Generally, these landscapes are random and informal with three to four distinct layers of plants. Large trees make up the upper canopy that provide the majority of shade. Next, smaller trees and large shrubs of varying heights make up the understory. Use this plant layer to add interesting forms, textures and blooms. Redbuds and viburnums, for example, are naturals for these areas. The woodland floor is the final layer. Lower growing woody and herbaceous species with graceful blooms, a variety of leaf shapes, attractive fruits and seed heads, varying heights and forms, and contrasting bright and dark colors will add to the appeal of this layer as you view it up close. Carex pensylvanica. Photo Courtesy Hoffman Nursery, Inc. The starting point for your shade garden is to examine what is already growing. Most shade gardens have the umbrella of large trees. The middle and ground floor need to be filled with appropriate plant material that match the soil, moisture levels and amount of sunlight the area receives throughout the day. 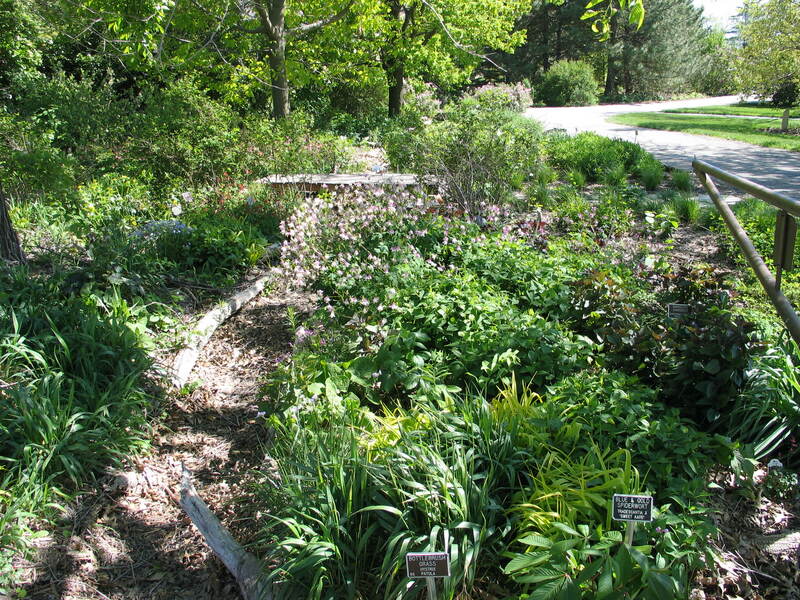 Shade gardens lend themselves to solitude because they are usually enclosed by plants . They are a natural oasis with a bench, water feature or fire pit surrounded by interesting plants. Here is a plant guide for each of these lower tiers of a shade garden. 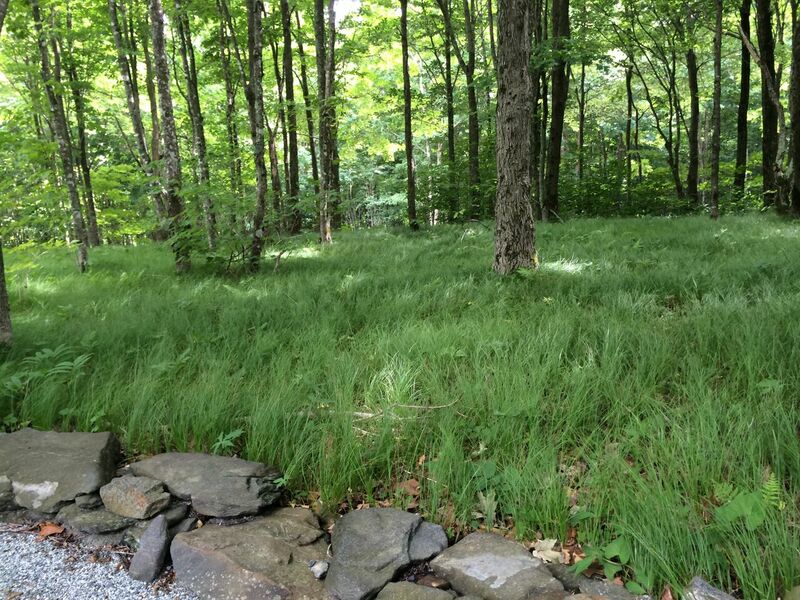 For our purposes, I will focus on plants for a medium to dry soil, with the ultimate goal to develop an area that is attractive to you and wildlife, such as birds and pollinators. 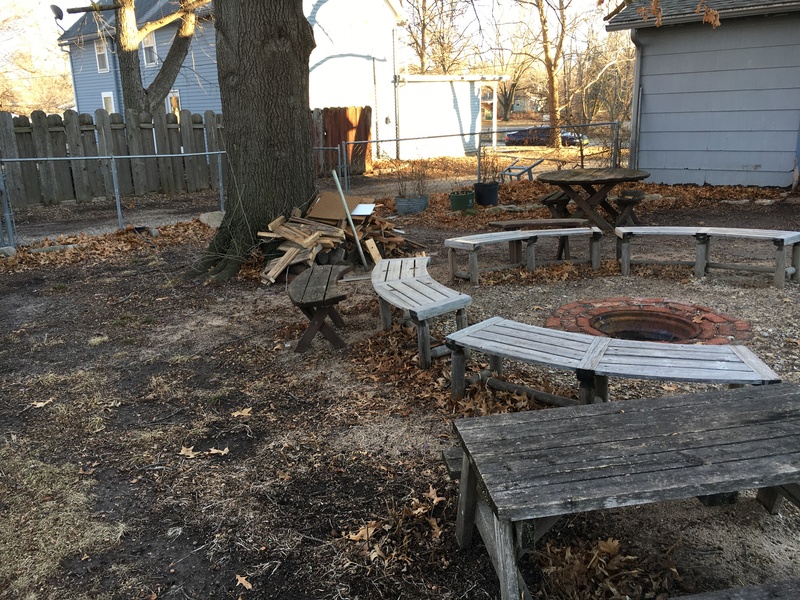 My shade garden project: I started with a fire pit under a 50 year old pin oak tree. It is essentially bare soil because nothing will grow under it very well. I will chart the progress over the next few years. So, my advice to you is this: Accept your shady situation. Mix it up. Combine plants with different textures, colors, shapes and heights to add interest. Knowing your light levels will help, too. Keep in mind that shade plants grow slowly. Choose larger plants initially to install or just be patient with what you have planted. Water as needed, but remember these shade plants are competing with the roots of a large tree. Maybe add a soaker hose to deliver moisture efficiently to the root zone. And finally, look to enhance all the layers of the shade garden, not just the lowest level. A native garden looks better when it mirrors the natural woods with all three dimensions growing harmoniously together. January and February can be dull months for a gardener. When the north wind whips and the drizzle freezes, spring seems a lifetime away. But here at the Arboretum these cold months are a busy time for seed treatment. 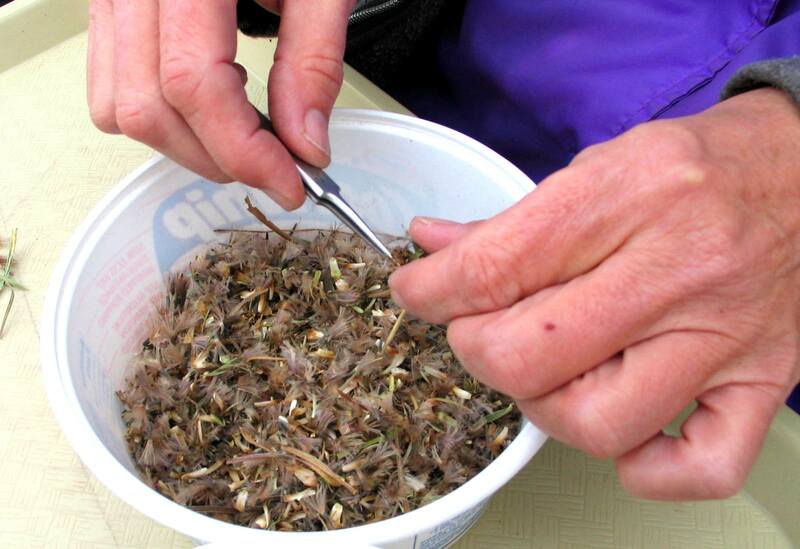 Seeds we’ve collected and ordered are prepared according to their species-specific needs. There are many specific types of stratification: warm-moist, cold-dry, cold-moist, water-soak, etc. Many prairie wildflower species require a cold-moist stratification period, a sort of “man-made winter”. Seeds are amazingly self governing, with built-in mechanisms to prevent germination until conditions are suitable. 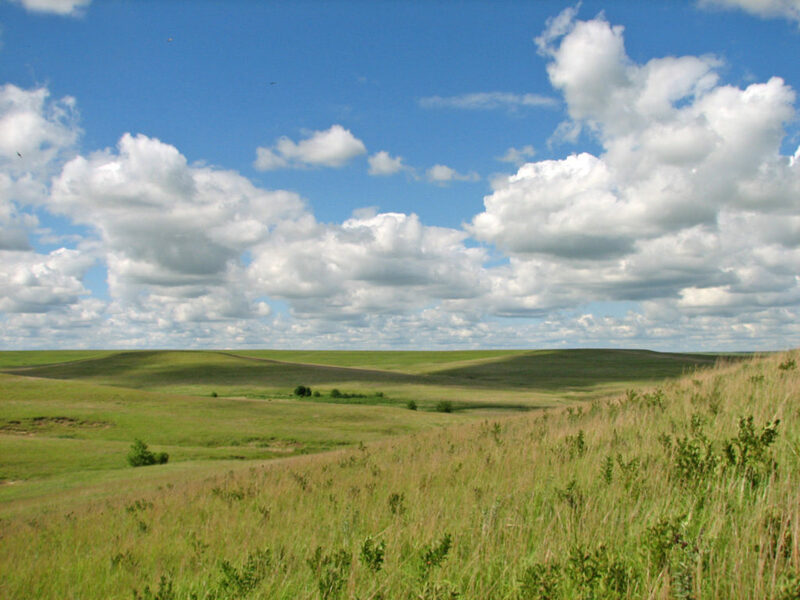 For species that have spent thousands of years adapting to the Great Plains, this means reading and reacting to seasons: long, cold, moist winter gives way to spring. Aha, time to sprout! It is the stratifyer’s job to convince the seed that winter has come and gone. Each species is a little different – some need 60 days of cold, some need 120, and some just 10. Be sure to look up the requirements of each species if you are stratifying your favorites at home. 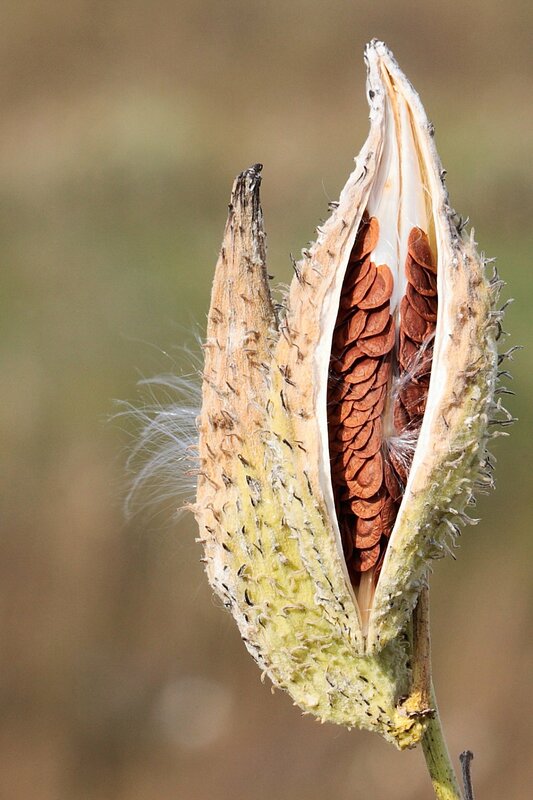 Common milkweed (Asclepias syriaca) seeds waiting to catch a breeze. 30 days of cold, moist stratification is all you need to germinate them for yourself. Scarification is any process that weakens the seed coat, purposely making it more permeable to gases and water that trigger germination. In the wild, these seeds would only sprout after many years of freezing and thawing, or perhaps after being passed through the digestive tract of a seed eating animal. If you want to germinate tough-coated seeds for your own garden (and you don’t have the digestive tract of a bird) then you will need to simulate nature’s scarification processes. This is done by nicking seeds with a knife or rubbing with sand paper. Seeds naturally activated by wildfire may need to be treated with nearly-boiling water. Some seeds perform best after an acid bath! Every seed is unique. 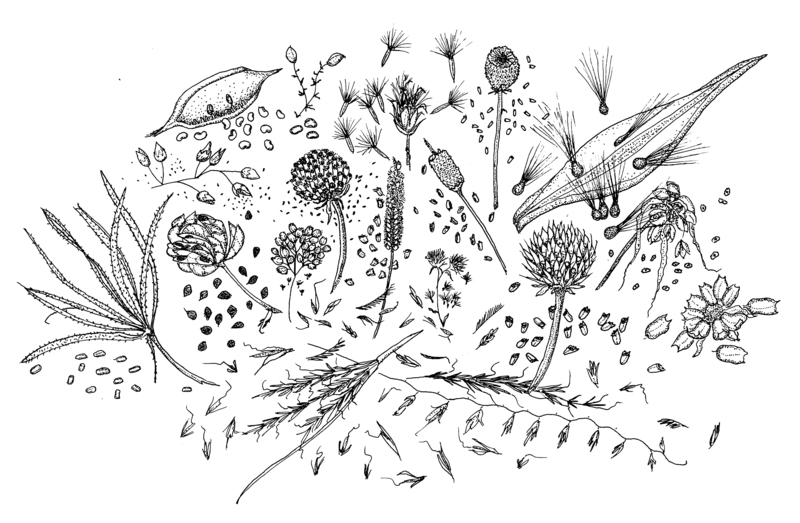 Line drawing of prairie seeds by Lorna Harder. 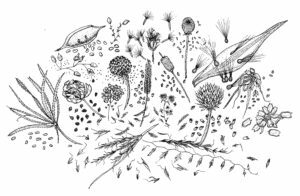 This is the featured graphic on our “Prairie Restoration” informational sign on the Arboretum grounds. Fall sowing is often less work intensive than manual seed treatment. Let mother nature do the work of breaking the seed coat by sowing your seeds in late fall. The cycles of freezing and thawing mixed with intermittent winter moisture will produce much the same effect as the previously mentioned methods. But be patient – some seeds may take several years to germinate this way. If you are looking for high quality native seed, Prairie Moon Nursery is a good source. To find species-specific information on seed treatment, check out Growing Native Wildflowers by Dwight Platt and Lorna Harder, available in our gift shop. It is hard to believe that it’s already 2017. We still have several months of winter to endure, but after the first of the year, my thoughts naturally turn toward spring. I anticipate this barren landscape bursting to life. Wildflowers, grasses, trees and shrubs emerge from their winter slumber to once again beautify the garden. 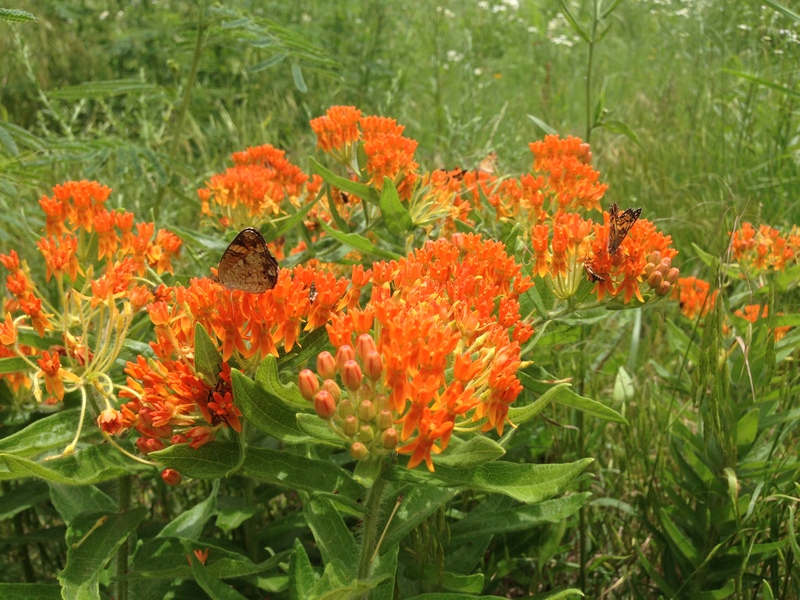 A wonderful wildflower and one of my favorites is butterfly milkweed, Asclepias tuberosa. With all the recent buzz about pollinators (pun intended), it seems fitting that butterfly milkweed is the 2017 Perennial Plant of the Year™, according to the Perennial Plant Association. This classic native wildflower is an excellent perennial that is readily recognizable with its bright orange flowers and the host of pollinators that they attract. Found throughout the eastern two-thirds of Kansas, they bloom in late May into August. Butterfly milkweed, along with other native milkweeds, are vital to the survival of the monarch butterfly. 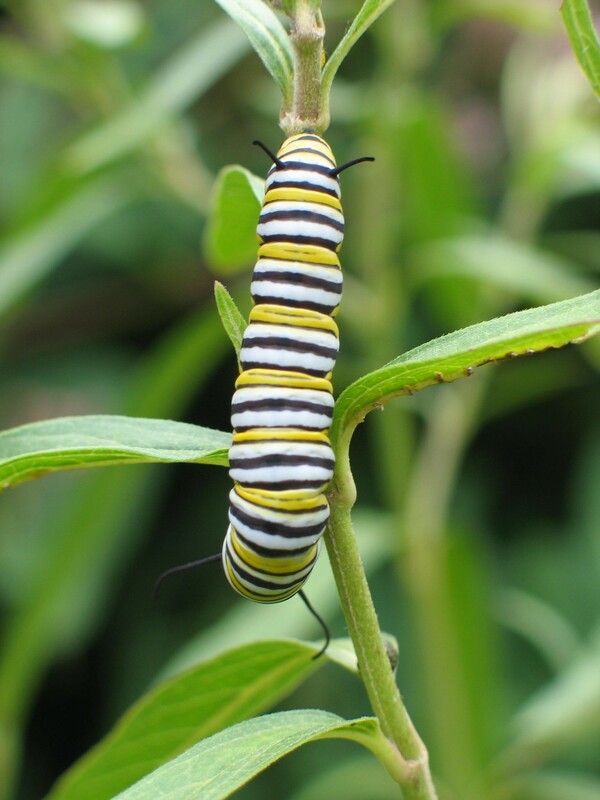 Monarch caterpillars will only eat on milkweeds. No milkweeds, no monarchs! If you plant milkweeds, monarchs will find them in your landscape. It is said that a monarch butterfly can smell a nectar source from up to two miles away. Recent habitat loss has made it critical that more milkweeds are added to landscapes across the migration path of monarchs. 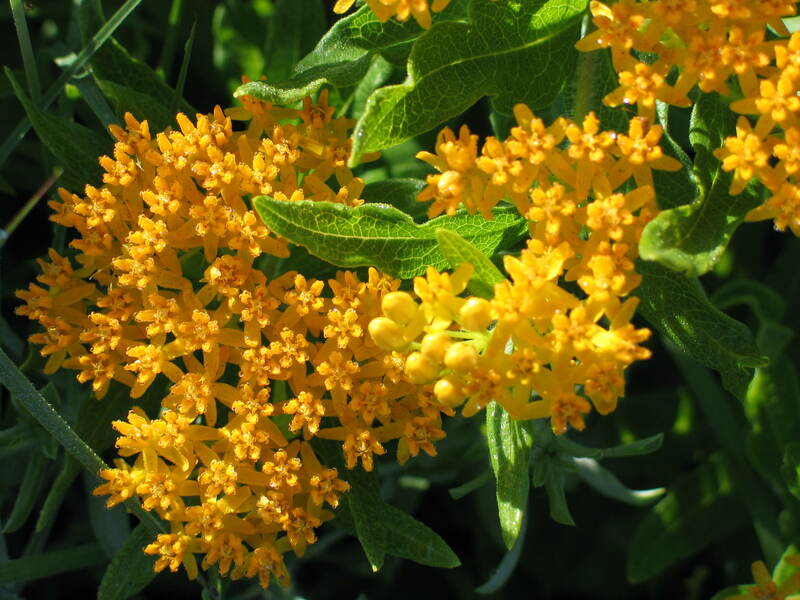 Butterfly milkweed is a stout one to two foot tall perennial with a deep, coarse, fibrous root system. The intricate flowers that reach skyward range from deep orange-red in the eastern part of its range to lighter orange and finally yellow farther west and south in Kansas. Unlike the numerous other milkweeds found in Kansas, butterfly milkweed does not exude a white milky sap when the stem is cut or a leaf is removed. 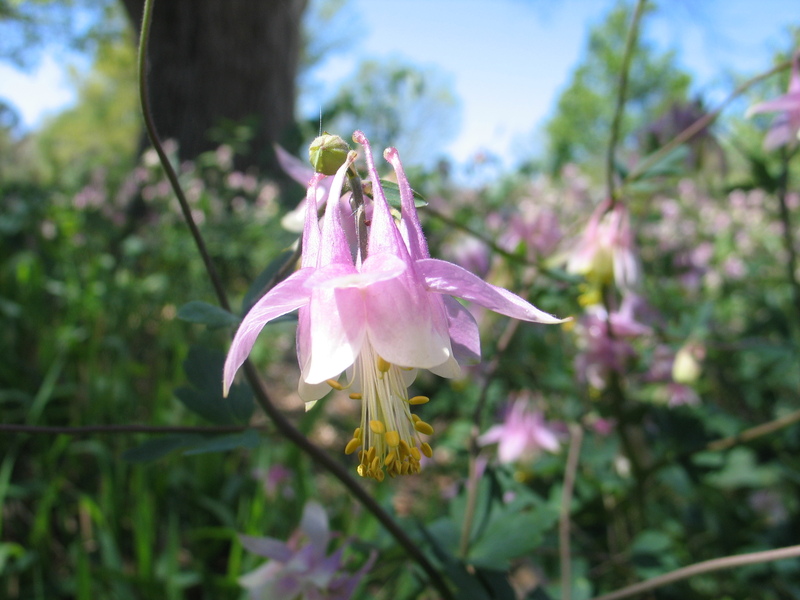 This sun-loving wildflower grows best in open areas intermingled with native grasses. While it prefers full sun and good drainage, it will tolerate light shade. It is also very drought tolerant once established. 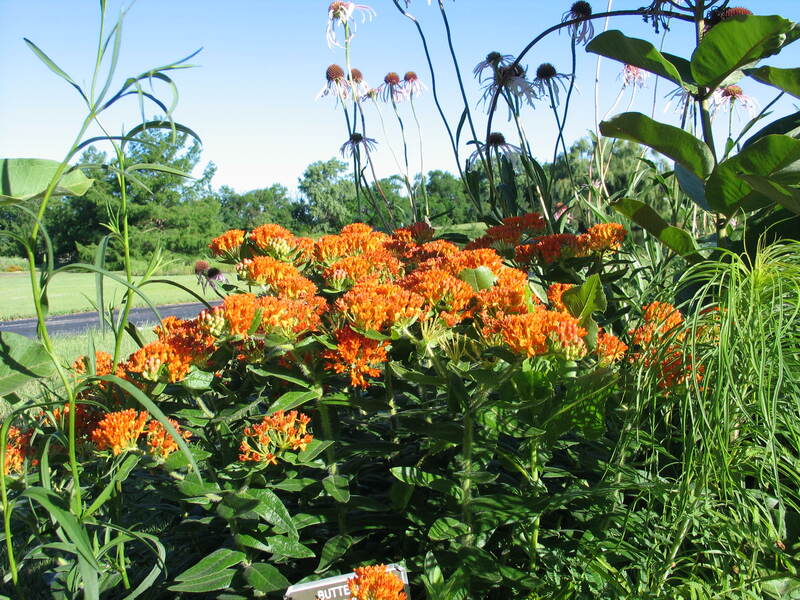 Several cultivated varieties of butterfly milkweed have been developed. These include ‘Gay Butterflies’, a mix of red, orange, and yellow flowered plants, and ‘Hello Yellow’, an exclusively yellow flowered selection. Butterfly milkweed has many outstanding features, but the most important quality is its ability to attract pollinators and other beneficial insects to your garden. If you get some established, it will quickly become a favorite. Its rugged character will make it a focal point in the summer garden for years to come. It is a beautiful wildflower that is at home in the prairie or in your landscape. Can you find a spot for a few in your garden?